The 2014 Chevy Silverado is built to be durable, and lightweight. Rather than simply add more steel to the areas that need strengthening, Chevy has adopted the formula used by automakers in their sports sedans and luxury crossovers to reduce mass while at the same time increasing strength. Trucks are meant to take abuse that cars and crossovers would never be expected to endure, and therefore, unlike the unit-body construction used in those vehicles Chevy uses a body-on-frame design. Now, materials once reserved for sports cars and luxury vehicles are finding their way into America’s work vehicle, the pickup. Chevy wanted to build the 2014 Silverado to be the best truck in the market, but also affordable. One way to reduce the amount of steel used in a vehicle component, but still make it stronger, is to employ steel that has a higher tensile strength. Tensile strength is a material's resistance to bending or folding and materials that have a higher tensile strength are considered stronger. These steels are also more expensive to make as a raw material, and also more expensive to work with. Therefore, it is impractical to just use that material throughout the vehicle. The graphic shown illustrates how many differing types of steel go into the Silverado. The yellow colors represent the highest tensile strength components. The A pillar (the support from the hood’s corner to the roof corner) and the B-pillar, (the support that runs vertically from the door sill to the roof) are the most important strength areas in a crash. Thus the the toughest steel is employed there. 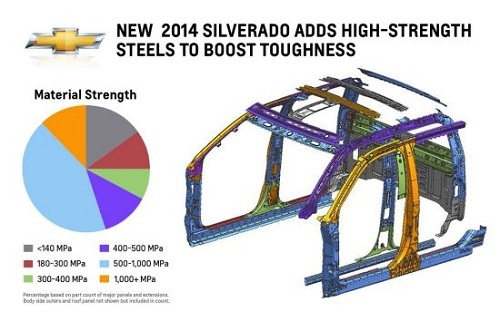 Special steel is not the only unusual metal used in the 2014 Silverado. Until very recently, using aluminum in a vehicle was part art, and part science. It was difficult to join the lightweight metal to steel, and in fact, the tools used to work steel and aluminum can’t be shared. Therefore, a common sense approach is used. Like many sports cars that want to balance weight to make a car less nose-heavy, the Silverado has an aluminum hood. The lighter, but softer metal is a good fit here where generally speaking a hard surface isn’t required, as it might be in say the truck bed. On that topic, the truck bed in the Silverado uses a roll-formed steel box for the pickup bed. Although it is more expensive to work than the sheet-formed steel its competitors use, Chevy feels that is an area the Silverado 1500 should be strong and durable. Anyone who has ever stepped through a rotted pickup truck bed (as the author has) will appreciate this design. Back on the topic of aluminum, Chevy uses the material in its suspension pieces where it will have the most impact on weight savings, for example in the steering knuckle and control arms. Like most modern vehicles the engine block and heads are also aluminum in Silverado trucks. Look for the 2014 Silverado in dealerships in January.